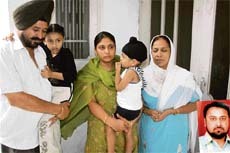 The negligence of a doctor posted at Gurdwara Govind Dham took the life of local resident Varinder Singh (30). The doctor allegedly refused to attend to the youth, who was gasping for breath. Annual losses attributable to pests have increased from Rs 600 crore in 1983 to Rs 45,000 crore in 2006. This was stated by M.S. Kang, vice-chancellor, PAU, during his inaugural address at a five-day workshop on “Safety measures against harmful effects of pesticides/farm accidents” being held on the campus. The Punjab and Haryana High Court has set aside the decision of Punjab Agricultural University to declare a student ineligible for admission to B.Tech (agricultural engineering) under the sports quota. The College of Home Science in Punjab Agricultural University (PAU) has once again fallen short of candidates despite the admission procedure having been relaxed. Earlier, only students from the science stream were admitted. However, students of other subjects can also join the course. This has once again raised the question of the viability of running the course. 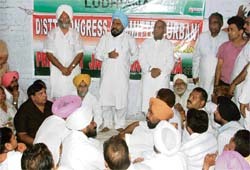 It was a great rush at the local Congress Bhavan with hundreds of aspirants of the party ticket for the forthcoming Municipal Corporation elections descending there as Punjab Pradesh Congress Committee (PPCC) president Shamsher Singh Dullo presided over a meeting of party leaders there. A splinter group of the ETT Adhyapak Union floated a new body, Elementary Teachers Union (Bulerheri), here yesterday. Khem Singh Gill, a former vice-chancellor of Punjab Agricultural University, has released a book of poetry, “Shama Eh Jaldi Rahegi”, of Dalip Singh Bawa. 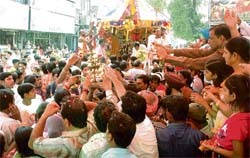 The Sri Jagannath Mandir Samiti today took out the annual rath yatra (chariot festival) of Lord Jagannath in Ludhiana. The festival involves the pulling of three large wooden wheeled chariots of Lord Jagannath, his sister Subhadra and brother Balabhadra. Punjab Agricultural University vice-chancellor Dr M.S. Kang has assured pensioners of taking care of their interests. The assurance came at a function organised by the PAU Pensioners Association to welcome Dr Kang on his taking over the office. Core committee members of Shree Manav Sewa Welfare Bureau, an NGO, met under the chairmanship of S.K.Thaman to discuss holding of free and fair municipal corporation elections. The police has arrested two persons, Darshan Singh, alias Darshi, of Lakha and Nahar Singh, alias Nahara, of Meenia with 15 bags of poppy husk from Hathur village. Maruti Udyog Limited launched its Grand Vitara in the city today. Transport minister Master Mohan Lal today exhorted students to acquire excellence to face the fierce competition in the future. Guru Nanak Dev Engineering College has started MBA from this session. 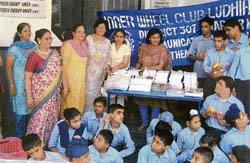 The second part of Creativity Day for students of classes VI to VIII was held in Guru Nanak Public School here today. The new academic session started at various city colleges here today. Prayers were held by the managements. The new academic session of SDP College commenced with havan. In what could be termed as a landmark surgical procedure in the course of kidney transplant, professor of urology and transplant surgery at Dayanand Medical College and Hospital (DMCH) Dr Baldev Singh Aulakh, successfully removed a donor’s kidney through one of the most advanced laparoscopic surgical techniques. The team of doctors lending assistance to the transplant surgeon in this innovative procedure included Dr P.L. Gautam and Dr Shikha Gupta. Civil surgeon Sat Pal Sharma today asked medical officers and supporting staff working on the "Revised National Tuberculosis Control Programme" (RNTCP) to aim for both qualitative and quantitative improvement as as the maximum number of patients could benefit from the same since the diagnostic facilities as also comprehensive treatment was provided free of cost by government health institutions. The Bhagwan Mahavir Sewa Sansthan organised a specialised camp for bone disorders at Sachin Charitable Hospital in Shivaji Nagar here yesterday. The Annual Sahodaya School Complex Table Tennis Tournament will be held at Alpine International Senior Secondary School, Ferozepore road, Ludhiana, on July 20 and 21.